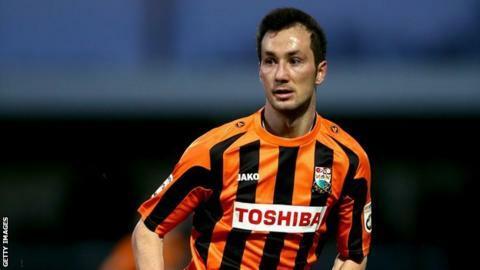 Barnet remained top of the Conference despite drawing at struggling Kidderminster Harriers. Former Harriers player Michael Gash almost gave Barnet the lead but he poked John Akinde's cross just wide. Danny Wright then put the home side ahead just before half-time after he reacted first to Lee Hughes' flick-on. But, after Akinde hit the bar, Barnet continued on the offensive and were rewarded with 18 minutes to go when Luisma tapped in from close range. With second-placed Bristol Rovers also drawing at Dover, a victory for Barnet next week against Gateshead means they will secure a return to the Football League. Match ends, Kidderminster Harriers 1, Barnet 1. Second Half ends, Kidderminster Harriers 1, Barnet 1. Attempt saved. Nathaniel Kelly (Kidderminster Harriers) left footed shot from the left side of the box is saved. Hand ball by John Akinde (Barnet). Elliot Johnson (Barnet) wins a free kick. Attempt saved. John Akinde (Barnet) right footed shot from the right side of the box is saved. Substitution, Kidderminster Harriers. Luke Maxwell replaces Josh O'Keefe. Offside, Barnet. Charlie MacDonald tries a through ball, but Charlie MacDonald is caught offside. Attempt missed. John Akinde (Barnet) header from the centre of the box misses to the right. Goal! Kidderminster Harriers 1, Barnet 1. Luisma (Barnet) right footed shot from the right side of the box to the bottom right corner. Assisted by Curtis Weston. Substitution, Barnet. Luisma replaces Sam Togwell. Josh O'Keefe (Kidderminster Harriers) is shown the yellow card for a bad foul. Offside, Barnet. Andy Yiadom tries a through ball, but Andy Yiadom is caught offside. Attempt missed. Kevin Nicholson (Kidderminster Harriers) left footed shot from outside the box misses to the right from a direct free kick. Graham Stack (Barnet) is shown the yellow card for a bad foul. Hand ball by Graham Stack (Barnet). Substitution, Barnet. Luke Gambin replaces Mauro Vilhete. Attempt missed. Andy Yiadom (Barnet) right footed shot from the right side of the box misses to the left. John Akinde (Barnet) hits the bar with a header from the centre of the box. Substitution, Kidderminster Harriers. Craig Reid replaces Lee Hughes. Offside, Kidderminster Harriers. Daniel Wright tries a through ball, but Daniel Wright is caught offside. Substitution, Barnet. Charlie MacDonald replaces Michael Gash. Foul by Keyon Reffell (Kidderminster Harriers). Conor Clifford (Barnet) wins a free kick. Substitution, Kidderminster Harriers. Keyon Reffell replaces Jake Green. Attempt saved. Josh O'Keefe (Kidderminster Harriers) right footed shot from outside the box is saved. Attempt saved. Andy Yiadom (Barnet) right footed shot from a difficult angle on the right is saved.